Be sure to read Brandless Resumes and Interviews Won't Work! Dr. Arlene & the Wise Job-Seeking Cow Need You! 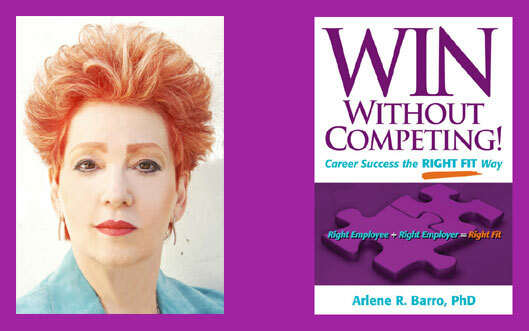 On Wednesday, November 28th Dr. Arlene, Branding and Hiring Expert, will host a Special Edition of WIN Without Competing! in which she will share her job search secrets. Dr. Arlene is searching for guests to interview and discuss their job search experiences during this busy hiring and firing season. To qualify as a guest you must have specific needs such as: cannot get interviews or can get interviews but no job offers or the wrong job offers. This radio show will give you the solutions that you need to succeed! Eager for Dr. Arlene to interview you on WIN Without Competing! and hear what you must to do to capture that job? Email your resume as an attachment in Microsoft Word to resumes@barroglobal.com. Be sure to explain your situation in such a way that Dr. Arlene can visualize what’s happening with your job search. Your email must be received no later than Saturday, Nov. 17th by 7 PM PT. After November 17th, Dr. Arlene or her assistant Jordan will contact the selected candidates to schedule a time to speak with Dr. Arlene. has a word of advice for YOU! Dr. A surrounds herself with smart, articulate people. Be sure to make a good impression in your email. You can learn a lot from her. I know I have! The last quarter of the year is the hiring season. Accelerate your job search to succeed. Learn how to convince employers to hire YOU. How to Become the Flawless Fit! In an employers’ marketplace you must be the Flawless Fit at interviews to capture the position you want. To succeed in your noble quest, eliminate distractors and objections during your interviews. What are these distractors and objections? How can I eliminate them and get the job offer that I want? Register for Dr. Arlene’s Teleseminar and find out. Use those strategies right after the teleseminar. You can WIN Without Competing! NOTE: Space is limited. Register early. Register now. You will receive via email the call-in telephone number and instructions after you register for the teleseminar. Includes Dr. Arlene's gift, The Flawless Fit Checklist, an interactive tool to help you master the essentials of becoming the Flawless Fit. This will be emailed, after you register, for you to work on during the teleseminar. To pay on PayPal click here. Payments are due on or before the registration date. After you pay on PayPal, forward your PayPal receipt to therightfitmethod@winwithoutcompeting.com. Be sure to provide your call-in telephone number and selected teleseminar date. Watch the iBrandU4Hire video, which features a wise job-seeking cow. Use Dr. Arlene’s app iBrandU4Hire: Rate Your Brand Zero to Hire. If you do not have an “iDevice”, Dr. Arlene has a solution. Questions? Call Dr. Arlene at 310-443-4277 or email her assistant Marissa at marissa@winwithoutcompeting.com. Romney Emerges: Obama Retreats -- Does he want to win Election 2012? Who is the real Romney? Who is the real Obama? The first debate revealed two new personalities. Romney was presidential, dynamic, and passionate. He demonstrated his knowledge of the issues exuding confidence and conviction. He presented his own presidential brand. Obama, on the other hand, retreated into the shadows allowing Romney to take charge. He cowered in the corner like a child not looking at Romney, bowing his head, and grinning. Obama looked as if he finally realized that he had a serious presidential contender. That apparently frightened him. Did he believe, prior to the debate, that there was no contest between him and Romney? If so, was he suddenly surprised to meet his contender face-to-face after battering him with attack ads for months? Is the real Romney the debater? If so, he is ready to walk into the White House. Is the real Obama the debater? If so, he needs to return to the White House and start packing. We cannot have a president who crumbles under pressure. Is that what’s happening now in the White House? Note to Job Seekers: If you had been at a corporate job interview, performing as Obama did during the debate, you would no longer be under consideration for the position. In the same situation, Romney could have been hired. If the Wednesday night debate, which focuses on domestic policy, turns into a brawl and the presidential candidates become attack dogs poised to bludgeon, they will both lose points. Here’s the winning strategy for both candidates. Yes, the same strategy. The question is who can execute that strategy to set a presidential standard to impress our voters and world leaders. • The slogans for both candidates need to be changed: Obama’s should be “Fast Forward” not “Forward” and Romney’s should be “Right Results” not a “Stronger Middle Class.” Why? Obama is asking us to proceed with him on the same course as the last four years, which contains many voter objections about his domestic policy accomplishments. Many see Romney as not representing all people. He reinforces that image with his “middle class” slogan coupled with his 47% remark. • Obama must walk us through the next four years with detailed plans on how he will remedy unemployment and the sluggish economic growth, targeting achievable results in which we can believe. Explaining what he will do to build relationships with Congress is critical in order to enact new plans. • Romney must convince us that he can make a silk purse out of a sow’s ear. He must communicate his plans and projected results with passion, determination, and commitment. We must visualize his success, including the strategies he will use to build relationships with Congress. Distractors, posed by either candidate, serve no purpose other than possibly rattling the other candidate. That strategy is a mistake. The clever debater should insert the knife with a velvet glove and a silver tongue. Voila! No physical pain and much to gain. The pundits have presided over post mortems of Obama’s last four years and Romney’s political and corporate careers. The debate must focus on the next four years, not the past. Fifty million people are expected to watch the debate. The pundits tell us that voters fall into two categories: those that focus on the likeability of a candidate and others who concentrate on how a candidate will handle the urgent issues. Likeability, unfortunately, will not predict the performance of our next president. We need a leader in whom we can trust to meet and even exceed our expectations. Each of us will decide who the winner is. A final word to both presidential candidates: focus on the end result, not your ego. Measured and succinct is the name of the game. Note to Job Seekers: Watch the presidential debate to learn what to do and not do at an interview. Remember how they handle distractors and objections! At the end of the debate, you should know the essence of what each candidate will achieve in the next four years and how they will do it. At your own job interviews, remember Obama and Romney. Firing, Promoting & Hiring YOU? Soon! It’s the season for firing, promoting, and hiring. If you think that your job is secure, think again. By the end of the year someone else could be sitting in your chair. What should you do and not do right now? • accelerate your search targeting early to mid-January to start your new position. Do not allow the upcoming holiday season to distract you from forging ahead. • evaluate your resume to determine whether you have a distinct, intriguing, and recognizable brand to attract the employers’ attention in a 30 second glance. • assess your communication skills, including your ability to read between the lines, when speaking with employers and convincing employers to hire you. • not walk away from your job unless you have another position – goodbye packages do not last forever. Do not assume that you will capture the right fit job quickly. • write a report detailing your accomplishments, not what you do. Focus on impact, results, and achievements for 2012. Submit that report in October to the person to whom you report and other key decision-makers. This report could help you retain your position as well as set the stage for a promotion. • arrange a time to discuss your 2012 achievements with the person to whom you report. It’s very important to walk that person through the report and hear feedback on your performance. Right now we have 3.7 million unfilled jobs. Do you know how to capture the job that is the right one for you? Be sure to watch the three upcoming presidential debates which are job interviews. Forget the political candidates’ party affiliation. Focus on what Obama and Romney are saying. Look for distractors and objections which have a significant impact on their brands. Not sure how this works? I’ll give you an example of a blatant distractor. On the Emmy Awards show, Jimmy Kimmel exposed his pantless legs displaying his short socks. If he had been a candidate on an interview wearing pants and had crossed his legs, the bare legs could distract the employer. From firsthand experience, it HAS distracted employers. Men should wear knee length hose! Visualize Jimmy Kimmel’s socks before an interview. To learn more about distractors and objections, go to my new app iBrandU4Hire: Rate Your Brand Zero to Hire which includes a video and questionnaire, listen to my radio show WIN Without Competing! and subscribe to my newsletter. Be sure to follow me on Twitter, LinkedIn, and Facebook. Dr. Arlene Barro is a UCLA-trained behavioral educational psychologist. She holds a Ph.D. with distinction for her doctoral dissertation on creativity. The Right Fit Method, which Dr. Arlene created, is the focus of her book WIN Without Competing!, nominated for a business book award. The book mentors job seekers on how to present themselves as the One Right Fit to employers. To do that, they must create their personal brand and master the Right Fit Branding strategies. Dr. Arlene developed the app iBrandU4Hire: Rate Your Brand Zero to Hire for job seekers to figure out whether they have an effective brand. Obama, Romney and YOU? Solution! No interviews? No job offers? Wrong job offers? Dr. Arlene says, “If you’re having difficulty getting interviews and job offers, let’s figure out the power of your brand.” To do that, go to the App Store. Select iBrandU4Hire: Rate Your Brand Zero to Hire, which Dr. Arlene created. She will interact with you throughout the app experience. After you evaluate your brand, you’ll know what needs to be fixed and fix it with Dr. Arlene. Don’t have an “iDevice”? Dr. Arlene has a solution. Eager to see the video immediately? Click here. Email Jennifer Orell, American Entertainment International (AEI) Speakers Bureau, or call her at 617-782-3111 Ext. 117. Got branding? Let's find out!